EAGAN, Minn. — Jacksonville and Minnesota each fell one game short of the Super Bowl last season, and they had another important trait in common, too. The Vikings finished first in the NFL last season with both the fewest yards and points allowed, and that didn’t go unnoticed by the Jaguars. They were second and, naturally, not pleased about it. 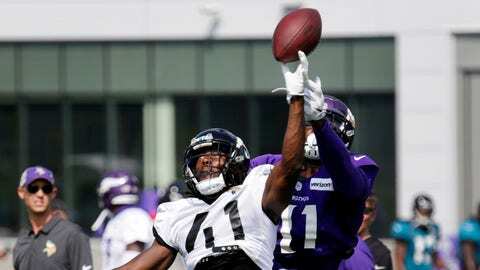 These joint practices the teams conducted in Minnesota this week naturally gave Jacksonville’s proud group another opportunity to show off those skills, even if there was no obvious way to compare. Jaguars coach Doug Marrone even needled his players a little before the trip as another way to bring out their best. As the second day of sessions at the sparkling, sprawling Twin Cities Orthopedics Performance Center in suburban Minneapolis wrapped up after a thunderstorm interruption on Thursday afternoon, the takeaway was clear from both sides. That other team is good. The Jaguars and Vikings will play on Saturday afternoon at U.S. Bank Stadium. Then they’ll go their separate ways for likely a few years, unless they are able to take that final step and match up in the Super Bowl. This experience, particularly facing these star-packed defenses, ought to stick with them for a while. Fortunately for the Vikings, the Jaguars aren’t on their 2018 regular-season schedule. Defensive end Calais Campbell had a disruptive couple of days going against the Vikings and their injury-thinned offensive line. Jaguars quarterback Blake Bortles had his share of plays thwarted by the Vikings. “When you see the matchups and you look at the talent on the other side of the ball, you’re looking at that and you’re saying, `Listen, these are the type of players that you have to go against to be a heck of a football team in the NFL,'” Marrone said. For Vikings running back Dalvin Cook, who’s now past the 10-month mark in his recovery from reconstructive ACL surgery on his left knee that cut short a promising rookie season, the Jaguars defense was a welcome sight. “I was pumped up. It actually felt like I was going into a game,” said Cook, who was held out of the exhibition opener at Denver last week and might remain on the sideline as a precaution on Saturday. Though there were no late hits or unnecessarily rough stuff, facing the Jaguars gave Cook some valuable time against a defense that wasn’t his own. One of the players not present remained a primary talking point: Jaguars cornerback Jalen Ramsey. He was left behind for disciplinary reasons and, earlier this week, made waves for his blunt commentary about opposing quarterbacks around the league published in a GQ magazine article .